So, you are planning your holiday, but don't really feel in the mood for traveling overseas. 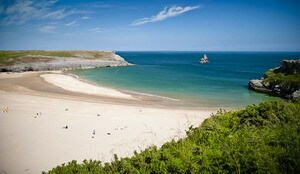 If you are living in the UK, how about a great holiday closer to home, in the most attractive county in Wales? If you consider holidays in Pembrokeshire cottages, you will be totally independent and not tied down to rules and regulations this year. Instead of staying in a busy tourist hotel and rushing to try and get breakfast before they stop serving, imagine getting up when you want to. Take a leisurely stroll before cooking your own tasty breakfast and enjoying it with that hearty appetite all that fresh air just gave you. OK, let's take a look at the gorgeous locations just waiting for you. The main historic and, in fact, largest town in Pembrokeshire is Haverfordwest. In the area, however, are several other lovely settlements and smaller towns, including Pembroke itself and Pembroke Dock, Milford Haven, Fishguard, Tenby, Saundersfoot, Narberth, Neyland and Newport. In the north west of Pembrokeshire we can find St. David's which is, in fact, the smallest town in the whole of the United Kingdom with a population of a mere 2,000 people. Besides so many lovely towns, large and small, Pembrokeshire has a really beautiful coastline. Along this coast can be found lovely sandy beaches (as in the Broad Haven south beach pictured right), many bays and some internationally important seabird breeding sites. There is also the Pembrokeshire Coast National Park, where you can take advantage of a 186-mile walking trail (depending on your energy!) which is known as the Pembrokeshire Coast Path. In the area at MIlford Haven, you will also find a large estuary and natural harbour with beautiful views. Seaside views are also available at the various bays in Pembrokeshire, Carmarthen Bay, Fishguard Bay and Newport Bay. Various islands are to be seen off the coast including Caldey Island, Grassholm Island, Ramsey and Skomer Islands, always interesting for a day out. Pentre Ifan burial chamber - Photo courtesy Paul Griffin History buffs will enjoy the Preseli Hills (known in the local dialect as Mynydd Preseli) up in the north of the county. There a wide area of the moorland boasts many prehistoric monuments and a really fascinating fact is that this is the source of the bluestones usedin the construction of the inner circle of Stonehenge in England. This somewhat boggles the brain when you think about how they transported these stones over that distance. Even if you are not actually a history buff, you can't help but be impressed by these iconic structures, as in the photo of Penfre Ifan to the left. 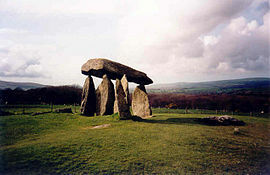 Pentre Ifan is an ancient manor located in the civil parish of Nevern, Pembrokeshire, Wales, containing the largest and best preserved neolithic dolmen in Wales. Probably the most popular areas to stay in Pembrokeshire are Tenby, Saundersfoot and the surrounding areas, as they do tend to attract the most visitors, but nothing is ever too far away for a day trip. All in all, Pembrokeshire is a beautiful, scenic location for your holiday this year. Be independent, live like a local in Wales in a comfortable and cozy cottage or beautiful larger home with swimming pool, depending on the size of your party.